Tom Petty and his mates have tightened their ranks and knit up internal problems to emerge a stronger, more cohesive musical unit. The spirit of their new album, "Let Me Up (I've Had Enough)," and the band that made it, is summed up in one simple line in the credits: "All songs performed and arranged by Tom Petty and the Heartbreakers." No big deal, you say. After all, it has been Petty and his four Heartbreaker cohorts for the last 11 years, ever since their first album came out. But there's more to it than that. "Everyone has a real band buzz," said guitarist Mike Campbell. "I just want to play right now. We're all digging playing together. It hasn't been this easy for a long time, or this fun." Indeed, during the past couple of years, the band has become more unified. If it's evidence you want, just listen to "Let Me Up," the group's smoothest, most confident record to date. Not bad for a band that almost broke four years ago. That was in 1983, after a tour supporting the "Long After Dark" album. The record hadn't fared well -- particularly compared to two immediate predecessors, "Damn the Torpedoes" in 1980 and "Hard Promises" in 1981 -- and the tour performances were a bit ragged. 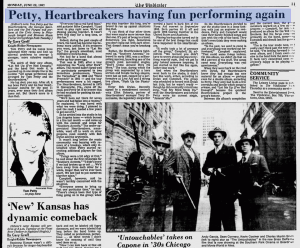 The Heartbreakers, formed in 1975 in Gainesville, Fla., came off the road, and Petty let it be known that he had no plans for packing his suitcases again. "We'd been out there for seven years and had fallen into a routine," he explained. "I was bored with what we were doing. I planned to quit the road; I needed a few years to get out of it." So he settled into the studio in his Los Angeles home -- which burned in a fire last month -- and came up with the concept and songs for "Southern Accents." The under-appreciated Heartbreakers, meanwhile, went off to work on other projects, most notably with Bob Dylan and the Eurythmics. It wasn't long before the music community was buzzing with rumors of a breakup, which only intensified when Petty started recruiting additional players for that album. "Things were a bit edgy at first," he said about the first rehearsals for "Southern Accents." "I didn't know if we had broken up or not ... We'd been away from each other for a while, longer than we've ever been apart. We just had to put ourselves together again." Campbell, however, said he wasn't terribly concerned with the situation. "Everyone seems to bring up that that one particular time," he said. "There's always been that type of thing going on in the group; when you stay together this long, you're bound to run up against situations like that. "I can think of four other times that were maybe more intense than that one. It's part of being in a band. Sometimes you fight. Sometimes you don't bang out with each other. That doesn't mean you're breaking up." Rather, the Heartbreakers tightened up. "Southern Accents," released in early 1985, was a million-selling success, launching one of the group's most successful singles, "Don't Come Around Here No More." The tour, during which the group was augmented by a horn section and female backup singers, went just as well, capped by a performance at Live Aid and a strong live album, "Pack Up the Plantation." Enter Bob Dylan. Recently signed to a management contract with Elliot Roberts, partner of Heartbreakers' manager Tony Dimitriades, the legendary songwriter needed a band to back him at the Farm Aid concert in September 1985. Both parties hit it off and spent 1986 touring together in the United States and Australia. Playing backup also turned out to be one of the best things that could have happened to the Heartbreakers. "It really took a lot of pressure off the group," Campbell, 36, admitted. "We learned you didn't have to worry about playing everything exactly right. And we got to play behind someone inspiring. It just started to feel like fun again, rather than work." And when the Heartbreakers went back to the studio, it didn't feel like work, either, according to Dylan and Campbell. The group was scheduled to record with Dylan last July, but he wasn't ready -- though he did eventually record one song, "Got My Mind Made Up," with the Heartbreakers and helped Petty write his current single, "Jammin' Me." So the Heartbreakers decided to use the studio time in a loose fashion; with just an engineer in residence, Petty and Campbell would take their barely finished songs and jam with the rest of the band. They didn't even think they were making an album. "In the past, we used to come in and everything was worked out beforehand," Campbell explained. "That could make things tedious. On this album, we didn't do that on 99.5 percent of the stuff. The songs came easy. Everything was real spontaneous." When they went back on the road with Dylan, the Heartbreakers knew they had enough top rate material for an album -- perhaps even for a double album, according to Petty. They only had to do a few overdubs and decide which songs to release, and "Let Me Up (I've Had Enough)" became the quickest Heartbreakers project in the group's history. Between the album's completion and the current tour, the group members worked on a few outside projects -- Campbell, for instance, produced an album for the Williams Brothers. But the focus remained primarily on the band, something Campbell said should last for quite a while. "I'm in the tour mode now, so I really can''t think past the next gig," he said. "I'm looking forward to the next album, and I think everyone else in the band feels the same way. It feels very committed now everyone's happy to be playing together."